"How do those small ports charge my devices?" We all love out smartphones, tablets, e-readers and other handy electronic devices that keep us connected. What we tend not to love so much is the chore of charging all these devices. Adapters and a mess of wires on the counter is never a pretty sight. In-wall USB Charger Devices changed all that but, really, how do those small ports power up our stuff? Let’s start with the power source. 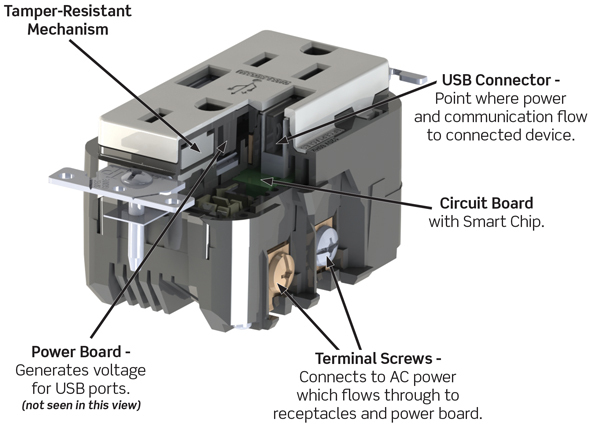 When using a USB Charger/Receptacle combination device the AC power which powers the receptacles is independent from the low voltage source which powers the ports. When a user plugs their device into the USB Port, the AC power is converted to low voltage source necessary to charge USB devices. Each USB port has a smart chip within the USB Charger Device that communicates to the external device, for example a tablet, which is being charged. The tablet learns from the smart chip the maximum current level it can draw and the charging process begins. This feature allows smart USB devices to reduce charging time considerably by drawing as much current as they need instead of being charged at lower fixed currents of 0.5A or 1A. The maximum current the T5632 can supply on both ports is 3.6A. 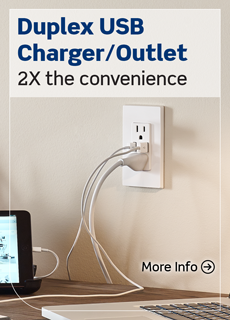 The 4-Port USB Charger Device doesn’t have receptacles but can simultaneously charge up to four USB devices. In addition to USB smart chips it also contains a special microprocessor. The microprocessor houses an optimization algorithm which actively manages the maximum current flowing between all the loads connected to ensure power is evenly allocated. The microprocessor dynamically adjusts charging current depending on how many ports are in use and the power demands of the connected devices. The maximum total current is limited to 4.2A. 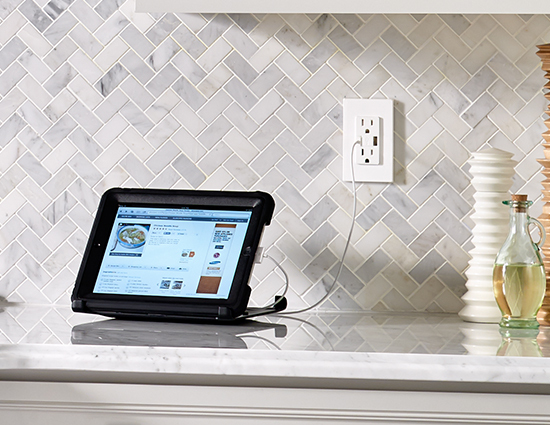 For safer operation, Leviton limits the maximum current that can flow through all of our Charger Devices. This helps protect both people and devices from the potential hazards of a device overheating while charging. It is important to note, however, that when full power is being drawn the wallplate may feel warm. This is normal. All Leviton Charger Devices go through rigorous testing in our in-house test lab, including temperature testing for overheating. All of our chargers are also safe electrically. They are designed to satisfy Class II power supply requirements to ensure complete electrical isolation from the AC line. Plus, all receptacles are tamper-resistant for added protection. The finished products are all UL or cCSAus certified. So for a more efficient use of space and the latest technology to power your electronic devices, USB Charger Devices provide the smart solution.